Since its debut in 2011, Chrome OS has succeed enough to make computer enthusiasts get curious. 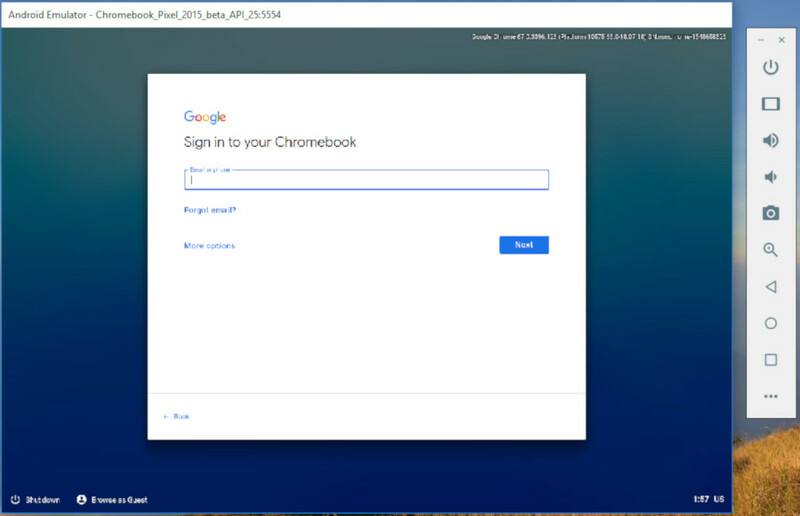 In order to be able to use Chrome OS you need to buy a Chromebook device since Chrome OS is only available on Chromebook devices. Google actually provides the open source version of Chrome (Chromium OS) to allow you to try Chrome OS on your computer but, it takes hard efforts to install it. Besides, Chromium OS can only be installed on Linux. 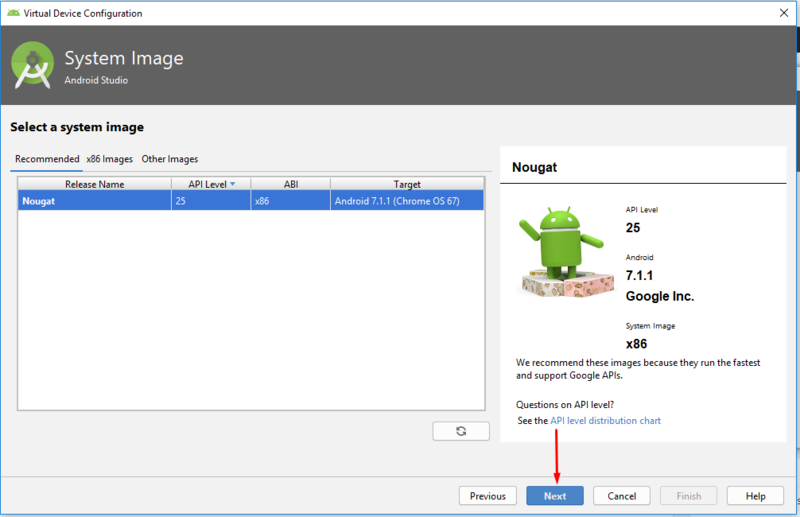 There is an easier way to give the Chrome OS a try using Android Studio. 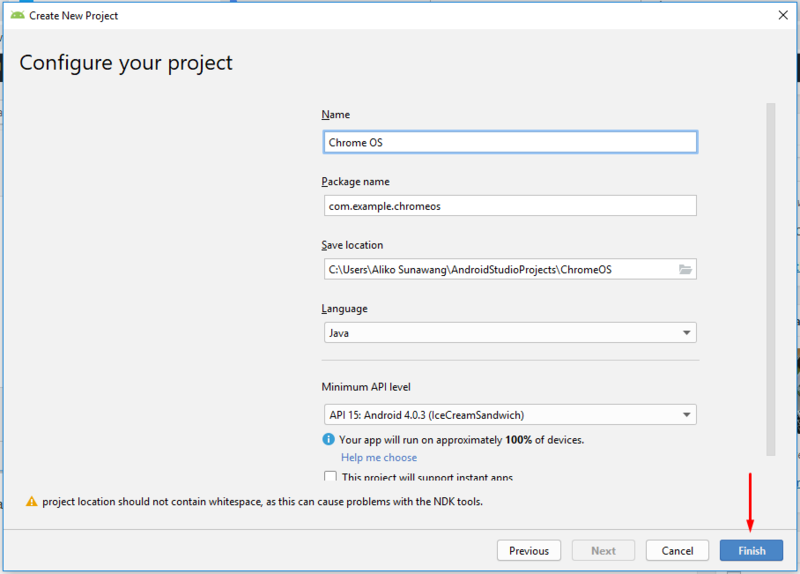 And since Android Studio is available on Windows, Linux and Mac, you can try Chrome OS via Android Studio no matter the operating system you use. 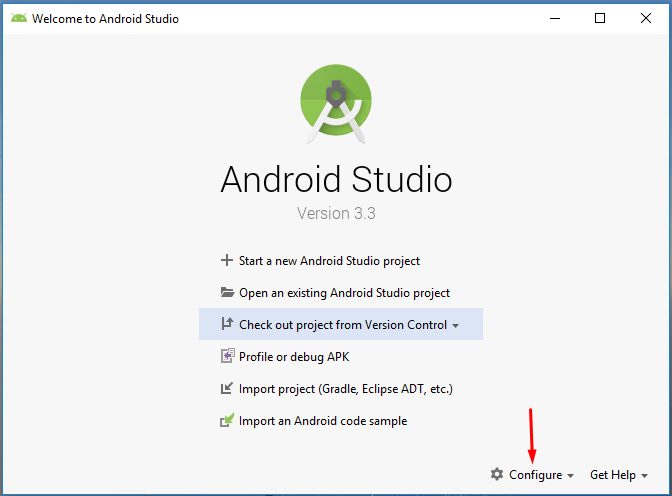 Android Studio itself is an official IDE for Android. One of the components contained on this tool is an emulator which allows you to run Android apps on desktop. It turns out, you can also use the emulator of Android Studio to run Chrome OS. 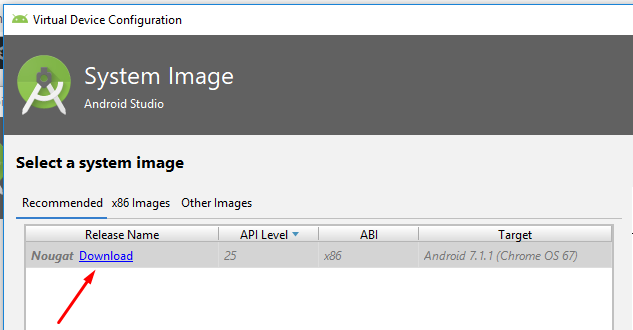 You can download the binary file (.exe file) of Android Studio for Windows 10 on its official site. Before installing, make sure your system has at least 3GB of RAM (8GB is more recommended) and 2GB of free disk space (4GB is more recommended). 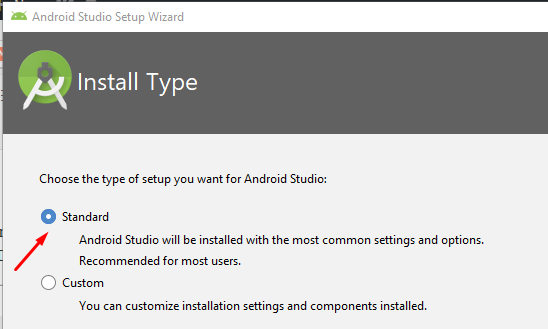 Once you have downloaded the binary file of Android Studio for Windows, double-click it to start installing. Click the Next button to continue. On the next step, you will be asked what components you want to install. 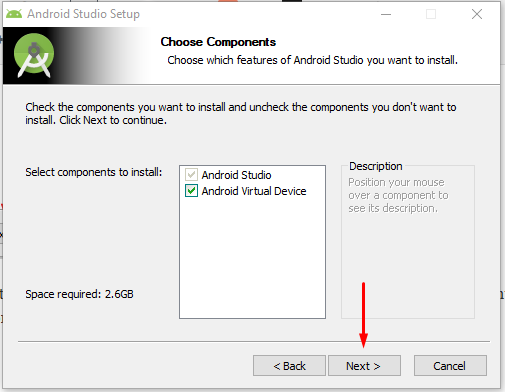 You will need all of the Android Studio components to run Chrome OS so just leave default to install all components and click the Next button to continue. 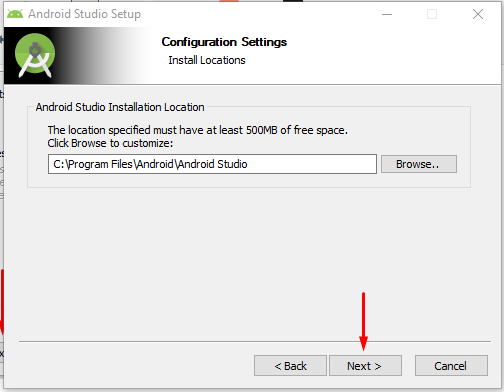 Next, select the installation location of Android Studio and click the Next button. The installer will be copying the necessary files to your computer. 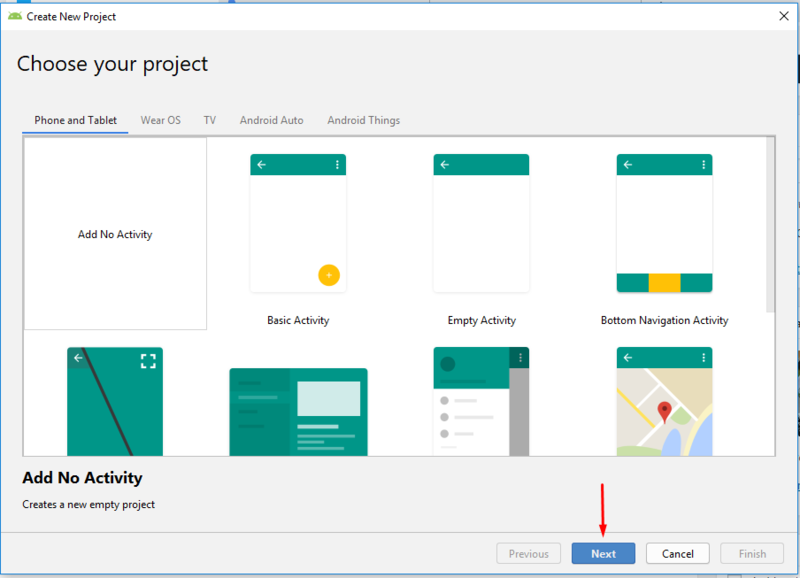 Once the installation process finished, launch the Android Studio app. On the first launch you will be asked whether you want to import the settings. Select the Do not import settings option and click the OK button to continue. On the setup wizard, select the Standard option. On the next step, leave it default and click the Next button. 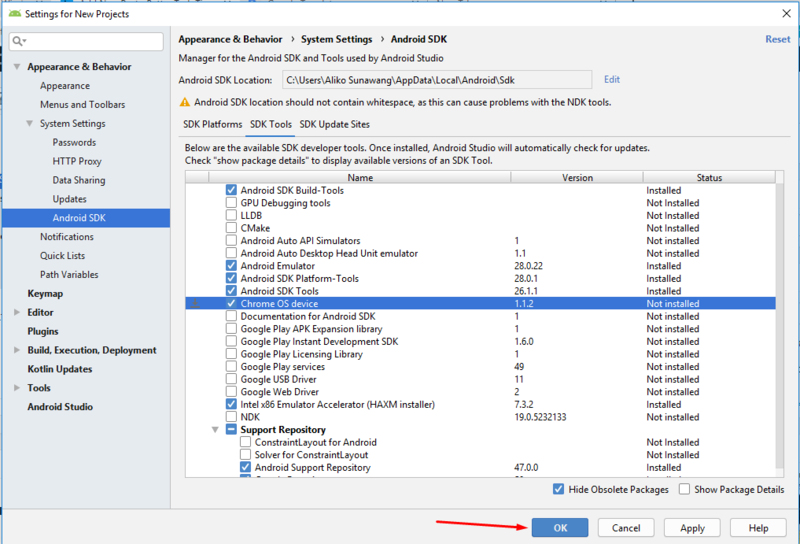 Android Studio will be downloading the necessary packages before you can use it. Wait until the process is done. This part can take a while so be patient. Don’t forget to click the Finish button once the download process is done. Once Android Studio is done downloading the necessary files and you clicked the Finish button, you will have the following window. 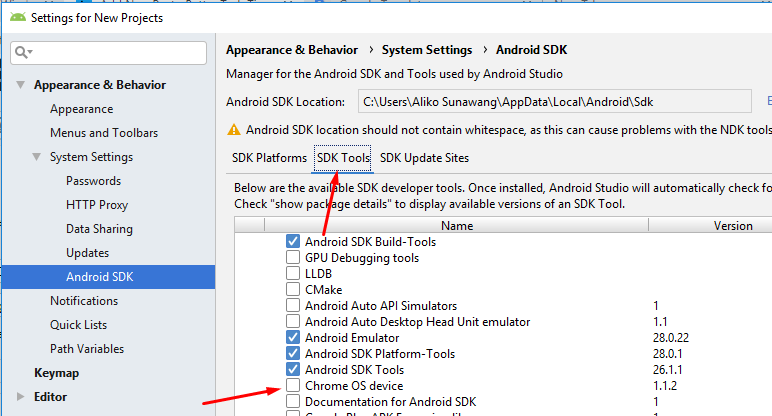 Click the Configure button at the bottom and select SDK Manager. 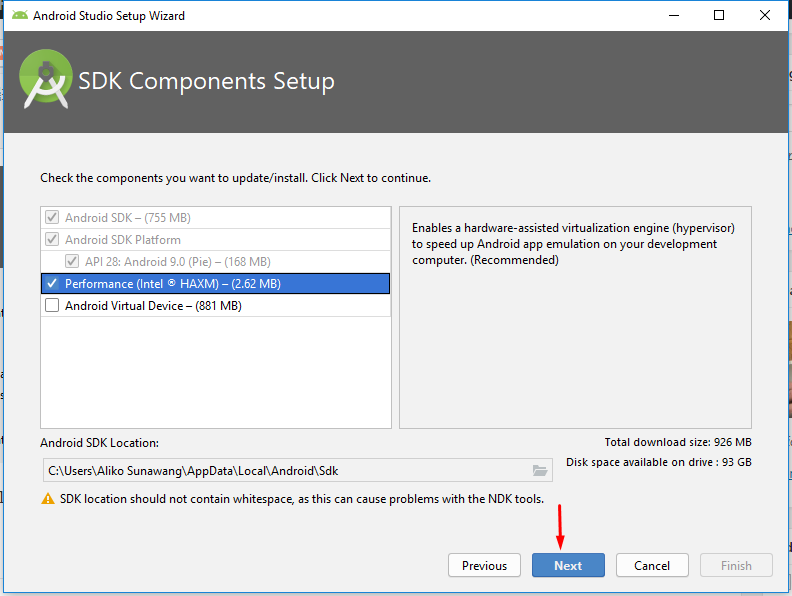 Next, go to the SDK Update Sites tab and click the plus icon on the right side of the window. A pop-up window will appear. 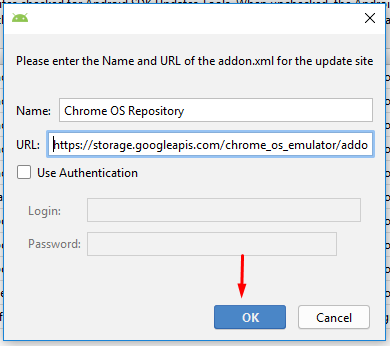 Type “Chrome OS Repository” on the Name field and paste https://storage.googleapis.com/chrome_os_emulator/addon2-1.xml on the URL field. Click the OK button. Ope a new box once again by clicking the plus icon. 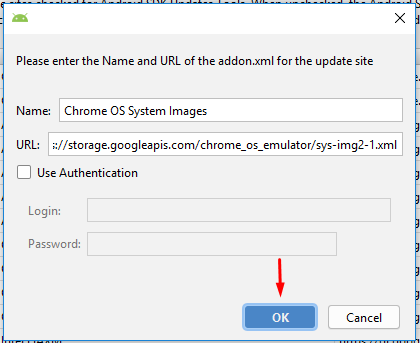 This time, type “Chrome OS System Images” on the Name field and paste https://storage.googleapis.com/chrome_os_emulator/sys-img2-1.xml on the URL field. Don’t forget to click the OK button. 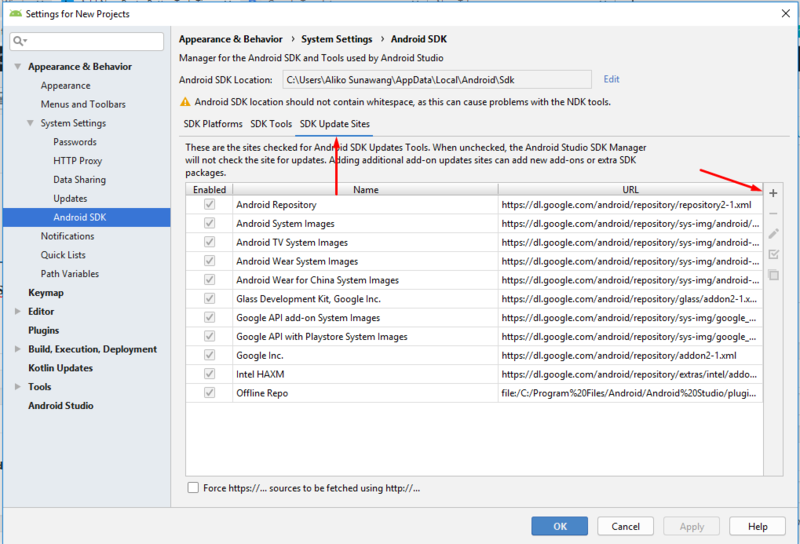 Now, switch to the SDK Tools tab and thick the Chrome OS device option. Click the OK button. This will download the selected tools (Chrome OS device on this case). Once done, restart your Android Studio. 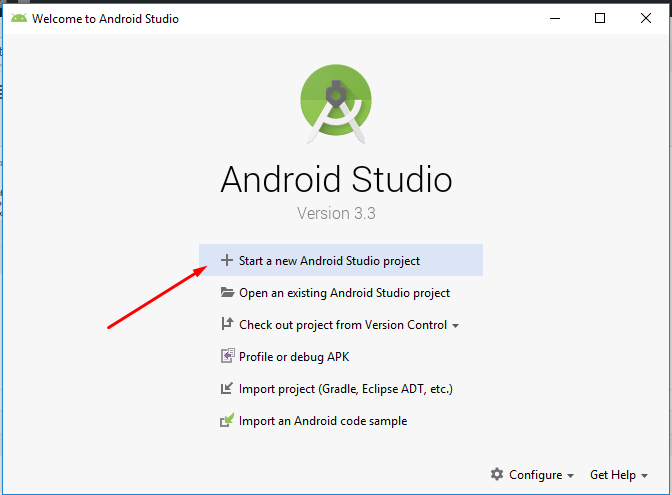 Create a new Android project by clicking the Start a new Android Studio project button. Select a device. You can select any device here. On my case, I choose Phone and Tablet by adding no activity. So, I just need to click the Next button to continue. Next, give your project a name and click the Finish button. 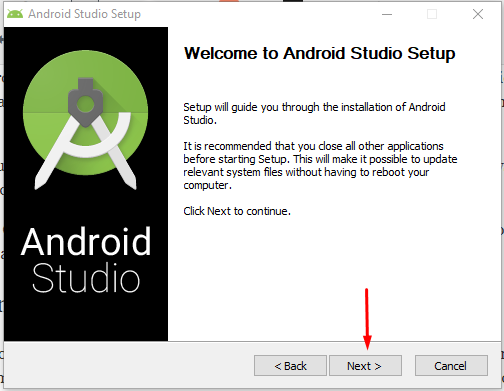 After clicking the Finish button, Android Studio will be downloading the requested files. Once done, click the Finish button. Next, create a new virtual device by clicking the AVD Manager icon on the upper-right. 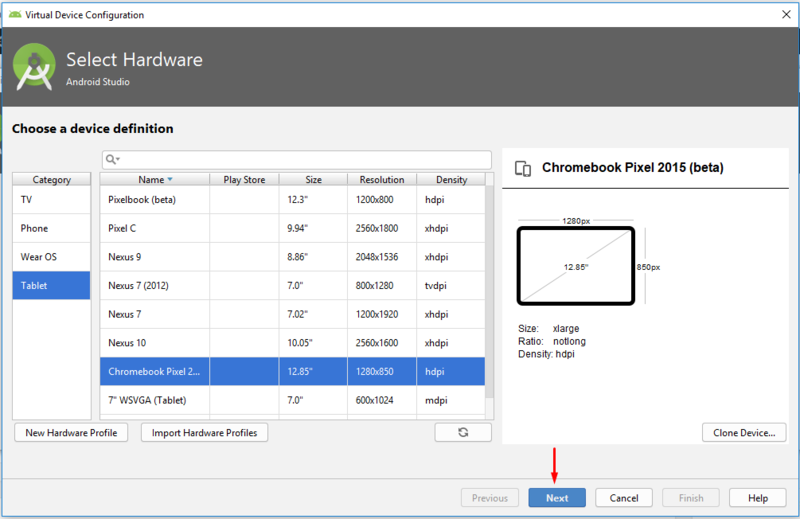 Select “Tablet” on the left panel and “Chromebook Pixel 2 2015 (beta)” from the main list and click the Next button. The next screen will ask you to select and download your Android version. Click the Download link to download. This process can take time so again, be patient. Click the Finish button once done. Next, click the Next button once again followed by the Finish button. Click the play button on the right side to run the virtual device. 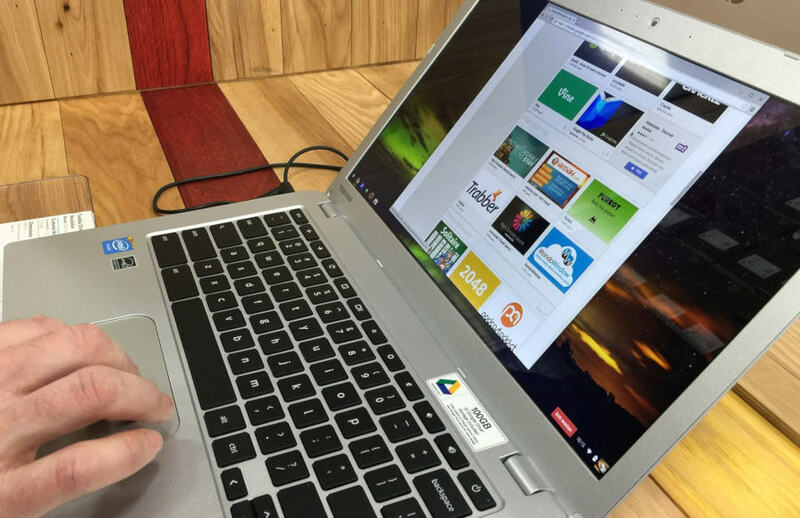 Once you click the play button, the newly minted Chrome OS will boot up. You will then be asked to log into your Google account and invited to sync your browser settings. 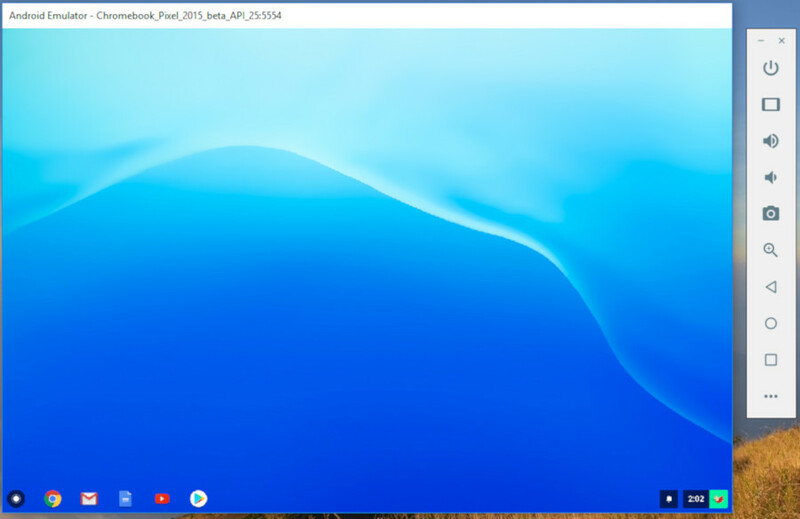 Here is the interface of the Chrome OS running on virtual Chromebook Pixel 2 via Android Studio. Note: you might will experience some keys on your keyboard not working.